Anti-inflammatory medication is usually undertaken for between 3 and 6 weeks. Analgesics in addition are only necessary for the first couple of days. Following surgery a visit to the physiotherapist is advised after 2-3 days. The physiotherapist will guide the patient as to the range of motion exercises to avoid knee stiffness, regular icing and control of any swelling. Formal rehabilitation with gentle resistance should not be started before 3 weeks and gym work not before 6 weeks. Jumping and particularly jogging on inclines should be avoided for at least 3 months. Arthroscopy, key-hole surgery or minimal invasive surgery reduces the incidence of post-operative pain, stiffness or complications to a minimum. The anaesthetic risks in such surgery is also very low are unusual unless there are co-existing medical conditions. Infection that involves the joint should be expected to be less than 1 in 100. However this would present as the knee becoming hot, swollen and throbbing and painful after 2-4 days or alternately at any period thereafter wards. Venous thrombosis should be expected to be in the order of less than 1 in 100. Thrombosis presents with a swollen tender calf muscle, or intermittent pain in the chest on deep breath. There is also a small theoretical risk to the major vessels and nerves around the knee. Stiffness sometimes occurs which usually resolves. Whilst the published research suggests that 94% of patients have a significant improvement following this type of surgery, in a small number of patients a return of the anterior knee pain may occur. Further problems may arise if activity such as jogging is started at too early a stage. If any of these or any other complications arise please inform the nurses or your surgeon if still in hospital or the general practitioner if at home. Generally surgical orthopaedic surgeon follow up is undertaken at 3, 6 and 12 weeks following surgery. If your job is sedentary, mostly sitting, you may wish to return after 2-3 days. However if the work is physically demanding or requires standing, walking or driving extensively then this may be delayed for between 4 and 8 weeks. Resisted exercises and training may be undertaken. This will speed up rehabilitation but only after a period of 6-9 weeks and only if this produces no further anterior knee pain. Swimming is often possible after 3-6 weeks and return to golf, gentle tennis or badminton may be possible after 9-12 weeks. More active exercises such as jogging and squash should only be undertaken thereafter wards. 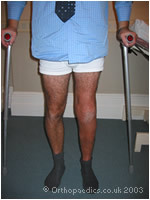 The first follow up appointment is usually arranged for 3 weeks following surgery and subsequently at 6 and 12 weeks.